When both relaxing or perming and colouring Black hair, the rule is; you must never perm a colour, you always colour a perm. What this simply means is that you must always do your colour after your perm. 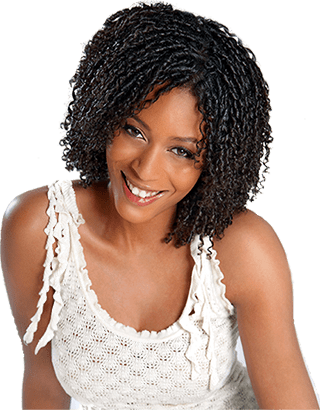 If it's a protein colour, also known as colour glazes, it is best to do it the same day as your perm, when the cuticle layers of your hair are open from the perming process. This way the colour will penetrate deeper into the hair shaft. This is better for the conditioning of your hair as well as making the colour last longer. If it's a semi or demi-permanent colour they may also be done the same day, depending on the condition of your hair. However, for all permanent colour we recommend that you book your appointment 3 to 7 days after you perm your hair, no more. 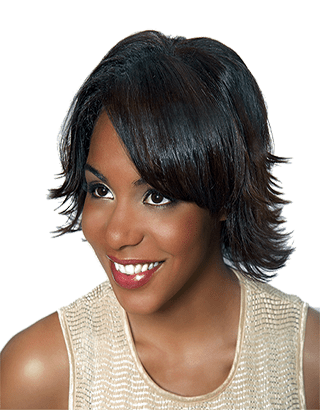 This is the best possible timing for coloring relaxed or permed hair, if you wait longer than 7 days, the process of combining these two services becomes much more problematic. If you’ve done an at home hair colour and the results are far from what you expected or even disastrous, please don’t try to fix it yourself! If you do, you might take away the one chance a colour expert has to do a proper corrective colouring process and still leave your hair in good condition. Don't be embarrassed, go and see an expert when you make an at home mistake with any chemical that you have applied. If you have chlorine in your hair and plan to swim at any time in chlorinated water, you must protect your hair. The best way to protect you hair is to wear a bathing cap. If you cannot or will not wear a cap, the next best thing to do is to thoroughly wet your hair before you go into the water and apply some conditioner and don't rinse it out. Your hair is like a sponge, once it is filled with water from a shower or tap, there will be little or no room for the pool water to enter and the conditioner will act as added protection. If you don't do this the chlorine will be absorbed into your hair and may cause your hair to fade, develop a green cast or for darker colours to take on a brassy tone. 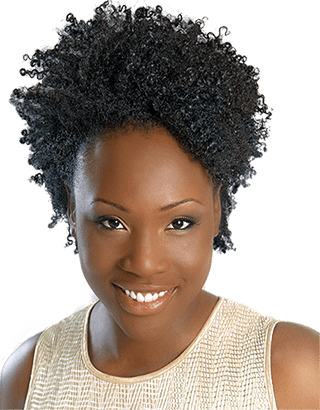 If you already have the problem described above you will need to do one or more clarifying treatments that will chealate out the chlorine from your hair. Chlorine cannot be removed if the hair is too porous. This chemical will leave your hair dry and tangled. Remember your hair will become increasingly dry, for every level of colour that you want to go lighter than your natural shade.This means that when you go from darker to lighter, it's an absolute must that you keep your hair hydrated on a regular basis. For people with Wash and Wear hair it is continously hydrated with the leave in products. For people who wear their hair predominently straight, they need to shampoo every three days. When you colour fine hair it will process faster and take colour darker, especially tones in the ash range. 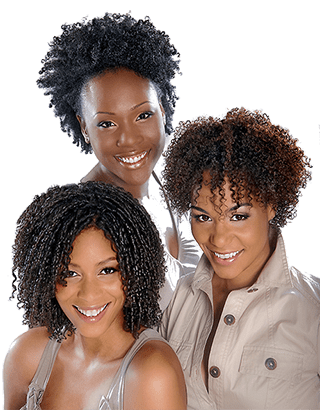 When it comes to Black hair, we recommend that you absolutely see a colour professional if you 1. want to take your hair lighter than three shades, 2. take your hair darker than three shades, 3. your hair is currently relaxed, permed or damaged in any way, 4.you want to make a major change in colour and want perfect or near perfect results, 5. you want a very natural looking result for your colour or highlights. If you have been colouring and want to go back to your natural colour, rather than just stopping the colouring process and having a major demarcation line, try having foil highlights put in that match your hair's own natural color (low lights). This way by slowly decreasing the amount of foils you have when you do your colour service, you will have a much more natural transition back to your natural colour. If you are going to colour your hair at home, or have been doing so, and have decided to try a different company's product. We strongly recommend that you do a patch test before you colour. How to do this should be described in the manufacturer's instructions included with your colouring kit. Briefly, what you do is mix a small amount of the colour formula and apply it to a small section of skin at the back of your ear or in the fold of your arm and wait 24 hours to see if there are any allergic reactions to the new formula. If all is well you may also want to do a strand test near the root area and process as per manufactures instructions. This way you will not be surprised at the end result and you may avoid problems later on. Temporary Hair Colour : usually lasts from shampoo to shampoo and is deposited only on the outside of the hair. Semi-Permanent Hair Colour : usually lasts from 4 - 8 shampoos (depending on how they are processed) and has no ammonia or peroxide. They can blend in grey and may become permanent on previously permed or coloured hair. Demi-Permanent Hair Colour : usually does not contain ammonia and uses a low volume developer usually under 10 volume to help activate the colour. They cannot lighten hair. They can be permanent and not be removed by shampooing especially on permed or previously coloured hair depending on how they are processed. Permanent Hair Colour : changes the natural colour of your hair. They can lighten or darken and as there name implies they are permanent. They contain varying degrees of ammonia and are mixed with varying degrees of peroxide developers to form a colour formula. They are not usually prone to fading and must be touched up every 4-8 weeks.